The Samurai Brotherhood had its genesis in my participation in a weekend men’s workshop in early 1992. This workshop lasted 48 hours and involved over 200 men stuffed into a gymnasium. The seminar had been run by Justin Sterling, founder of the Sterling Institute of Relationship and its men’s arm, called the Men’s Division. Following my participation in this weekend I spent a year on a Sterling men’s team, meeting on a weekly basis with another 8 guys or so. Over the course of the year I became quite close to the men, and when I had to leave due to circumstantial reasons, I recall how surprised I was by the depth of emotion I felt. Initially I didn’t think that I had too much in common with these men—we had been assigned to teams based on geographic location upon completion of the weekend workshop—but at the end of my year I realized that the connection I felt with them far surpassed anything I’d expected to experience when I joined the team a year prior. 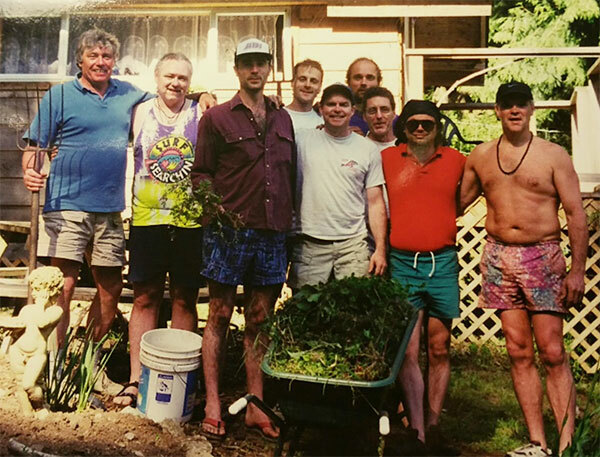 A couple of years after this, in 1994, I founded my own personal growth community (Shamballa Trainings) up in the British Properties of West Vancouver. I ran this growth school until 2001. During that time, I worked with several hundred participants in my various transformational programs. The community was approximately 65% women, and accordingly we felt the need for a structure within the community to support men and so created a small men’s group. Pictured is of one of our original Brotherhood groups from around 1996—yes, that’s me in the red shirt. This group had its share of ‘Clints’ – such as the guy on the far left with the pitchfork! This men’s group underwent many changes over the years, arising and fading away, largely a reflection of my involvement in multiple projects during that time. In 2001 I took a year sabbatical from my work, and then in 2004 re-booted the men’s community again. A couple of years later I became busy teaching seminars (for both men and women) in various cities in Europe and Canada and publishing four books. In 2008, with the help of my old friend Yona Bar-Sever, I rebooted the Samurai Brotherhood again and we ran that version of it up until around 2012. In March of 2015 I launched the latest reboot, beginning with just six men. As of mid-2018 the Brotherhood active membership list in Vancouver is approaching 200 men. Two things stand out about this latest upgraded version of the Brotherhood: the age, and the enthusiasm of the participants. Previous iterations of the community averaged about 40 years of age. Our current average age is probably between 25 and 35, being comprised of mostly Millennial generation men (born after 1982). We have some older guys, but the youth of this Brotherhood is one of its strengths, bringing the vitality (that comes in exchange for seasoning, let us say). I think a men’s community that has a majority of younger men and a minority of older men is more natural and works better than the other way around. The growth of the current Samurai Brotherhood has demanded certain changes in the group structure. In early 2016 we broke up the initial large group and began to divide into separate groups, which we call ‘squads’ (after the military term). As of mid-2018 we currently have 10 squads in the Vancouver area, with continued plans for expansion. Each squad is led by two co-captains, senior members of our brotherhood. Men in our modern society—especially younger men—need in their lives the sort of quality men the Samurai Brotherhood has. The unique makeup of our community, along with the overarching framework of the 14-Point Code of the Conscious Warrior that I spent decades formulating and refining, makes it a ripe ground for growing excellent, quality, strong men.